The Fairmont Washington, D.C.’s Holiday Lights and Breakfast Delights Package is guaranteed to make spirits bright this holiday season. Guests can take-in the festively decorated lobby and courtyard, which is transformed into a crystal garden, filled with thousands of tiny white lights, shimmering holiday trees and animated reindeer. Next to the garden is a 20-foot holiday tree and gingerbread village created by the hotel’s executive pasty chef. Outside of the hotel, families can delight in the Downtown Holiday Market, ice-skating, the National Christmas Tree and National Menorah on the White House Ellipse and much more. Offer includes nightly accommodation and continental breakfast for two. Available from November 20, 2009 to January 11, 2010, rates start from $142 USD per night. Celebrate the holidays this year amid the lush beauty of Hawaii and receive a 5th night free at The Fairmont Orchid. Guests are invited to create their own holiday memories by enjoying daily Hawaiian cultural activities, or rejuvenating at the hotel’s award-winning Spa Without Walls. This special promotion is valid only on new reservations booked by September 30, 2009. Package includes nightly accommodation, Keiki (kids) Aloha program, 5th fifth night free and complimentary self-parking. Available from December 21, 2009 to January 4, 2010, rates start from $629 USD per night. Even Scrooge won’t be able to resist the holiday trappings from The Fairmont Olympic Hotel in Seattle this holiday season. The festivities begin with the hotel’s annual lighting of a 25-foot Noble Fir, the always-popular Festival of Trees celebration, and the unveiling of the whimsical Teddy Bear Suite. Brimming with dozens of fluffy teddy bears and plenty of holiday cheer, the Teddy Bear Suite welcomes thousands of visitors throughout the holiday season with donations supporting the Seattle Children’s Hospital. Throughout the holiday season, visitors will enjoy everything from hot roasted chestnuts, Gingerbread Artistry and a Holiday Choir Series. Festive rates at the hotel start from $179 USD per night. Take in the sights, sounds and smells of a winter wonderland this holiday season at The Fairmont Chateau Lake Louise with their Magical Mountain Christmas package. Sit back and watch the gleaming smiles of loved ones while they skate on Lake Louise or ski down the powder mountains. Whatever the winter activity, this package will leave guests with memories to last a lifetime. Offer includes nightly accommodation, breakfast daily, welcome amenity and a sleigh ride. Available from December 23 to 26, 2009, rates start from $399 CAD (~$380 USD) per night. A minimum 3-night stay is required. There is nothing more enchanting than celebrating the holidays in a historic château. Every year, Quebec City’s Fairmont Le Château Frontenac offers a variety of events to usher in the season, and guests can take pleasure in the warm ambiance and beautiful decorations that fill the hotel. As a final touch to the festivities, all holiday dinners and brunches feature live musical entertainment for families and friends to enjoy. The Château’s A Royal Christmas Package includes nightly accommodation, gastronomic dinner at Le Champlain Restaurant on Christmas Eve, breakfast served in-room on Christmas Day, Christmas Day dinner and dance in the ballroom and buffet breakfast at Le Café de la Terrasse on Boxing Day. For added ambiance, guests can enjoy a mini illuminated tree in their room for $50. Available for a two-night stay on December 24 and 25, 2009, rates start from $639 CAD (~$610 USD) per night. Head to the province of Quebec and celebrate the season at one of the world’s largest log cabins, Fairmont Le Château Montebello. Here, guests can cozy up to the six-sided fireplace for a game of checkers, head outdoors to skate on one of two resort ice rinks, or take a swim in Canada’s largest indoor hotel pool. With the hotel’s Christmas in the Country package, guests receive three night’s accommodation, Christmas log and hot chocolate served on arrival, sleigh rides, one continental breakfast, Christmas brunch, children’s programs, dancing and entertainment, and three dinners including the traditional Christmas dinner. Complimentary access to the sports centre, indoor pool, outdoor skating rinks and cross-country ski trails is also included. Available December 23 to 26, 2009, rates start from $799 CAD (~$762 USD) per person for a 3-night stay. Visit The Fairmont Jasper Park Lodge in “the land of a million Christmas trees” and celebrate the holidays with the resort’s 2009 Festival of Christmas package. Perfect for families, this offer includes nightly accommodation, in-room Christmas tree, Christmas Eve reception with a visit from Santa, a mixology class, Maligne Canyon ice walk, Maligne Valley tour, recreation rentals (cross country skis, skates, toboggans), lighting of the Great Tree, stocking decorating, history tours, skating with elves on Lake Mildred, caroling in the Great Hall, chocolate tasting, Santa’s Workshop craft class, Christmas cookie bake, horse-drawn wagon rides, holiday movies, holiday bonfire with s’mores, holiday bingo, Santa’s Village Holiday Hangout and recreational programs and more. Available from December 23 to 26, 2009, rates start from $399 CAD (~$380 USD) per night. A minimum 3-night stay is required. Bermuda’s pink sand beaches and temperate climate make The Fairmont Southampton an ideal December getaway, and with nearly two weeks of daily guest activities for children and adults alike, the hotel and its 13 Days of Christmas package are certain to make the holiday season unforgettable. Guests looking to get into the festive spirit can take part in jolly activities like cookie making, wine tasting, sandcastle competitions, Christmas caroling, nature walks and seasonal spa experiences, all leading up to Santa’s grand arrival. Holiday activities are available from December 22, 2009 to January 3, 2010, and rates start from $289 USD per night. An old-fashioned holiday awaits guests at Fairmont Hotel Vier Jahreszeiten in Hamburg this season with the hotel’s Christmas in Hamburg package. Friends and families can enjoy stunning views of Alster Lake from their luxury appointed suite while sitting beside their very own Christmas tree. Or, after a day of taking in the festive sights and sounds of Hamburg’s bustling streets, guests may wind down in the evening in front of a crackling open fire at the Wohnhalle Lounge. Offer includes three night’s accommodation, breakfast, a decorated in-suite Christmas tree, and 4-course Holiday menu at Jahreszeiten Grill on December 24th. Available for a 3-night stay from December 22 to 24, 2009, rates start from 1,916 € (~$2,875 USD) per room. Avoid the chilly weather and holiday craze this season and head to Fairmont Mayakoba for the resort’s Holiday Season Adventure package. Offer includes nightly accommodation, daily buffet breakfast for two adults and two children six years old and under at La Laguna restaurant, Christmas dinner for two at La Isla Lawn and daily activity program. Up to two children stay free in parent’s room. Rates start from $569 USD per night. Celebrate the holidays at Fairmont St Andrews, Scotland this year. With caroling, brightly decorated Christmas trees, cookies and milk for the kids on Christmas Eve, stockings hung in guestrooms and a visit from Kris Kringle himself on Christmas Day, families are certain to have a holiday season full of joy and memories. The resort’s Christmas Dreams package includes nightly accommodation and traditional Scottish Breakfast. Available from December 20 to December 29, 2009, rates start from £119 (~$197 USD) per night. For those in search of the perfect present this holiday season, why not give friends and family the chance to create unforgettable memories with a Fairmont Gift Card. Each card is the gift of world-renowned accommodation, elegant dining, luxurious spa treatments and more at unrivaled destinations across the globe. Gift cards may be purchased online or at any Fairmont hotel and range from $50 to $5,000. 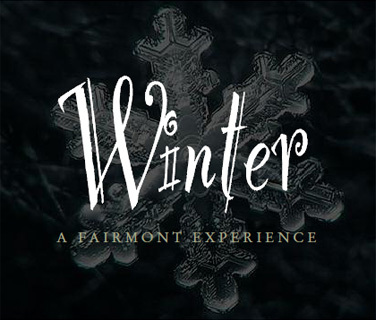 For more information or to purchase a Fairmont Gift Card, please visit www.fairmont.com/giftcard. All packages unless noted otherwise are subject to availability, priced per room, per night, exclude taxes and are based on double occupancy. Prices quoted are in local currency. For reservations, please visit http://www.fairmont.com, call 1-800 441 1414 or contact your local travel professional. A leader in the global hospitality industry, Fairmont Hotels & Resorts is a celebrated collection of 59 distinctive hotels, which includes iconic landmarks like The Fairmont San Francisco, Fairmont The Norfolk, Nairobi and Canada’s Fairmont Banff Springs and more than 20 new properties in development, including London’s The Savoy and the Fairmont Peace Hotel in Shanghai re-opening next year following extensive restoration programs. Fairmont hotels are one-of-a-kind properties where sophisticated travelers can discover culturally rich experiences that are authentic to the destination. Situated in some of the most exclusive and pristine areas in the world, Fairmont is committed to responsible tourism and is an industry leader in sustainable hotel management with its award-winning Green Partnership program.